There's a bubble surge of newly funded and incumbent businesses looking to tackle large- and medium-scale energy storage in a broad spread of grid-edge applications. We just covered Panasonic's aim to use lithium-ion batteries in solar-equipped buildings to solve Japan’s post-Fukushima energy crisis. The Japanese giant is looking to California and other U.S. markets for the business models to make this distributed energy system work. We went deeply into Elon Musk's $5 billion Tesla Giga battery factory and his plans for automotive and stationary energy storage in partnership with cousin company SolarCity. AES Energy Storage now sells a prepackaged, modular energy storage system. Large-scale energy storage startup LightSail Energy added former GE executive Volker Schulte as COO and Neel Sirosh, former CTO at Quantum Technologies, as VP and GM of its energy storage group. Schulte was GM of engineering for GE’s gas engine business. 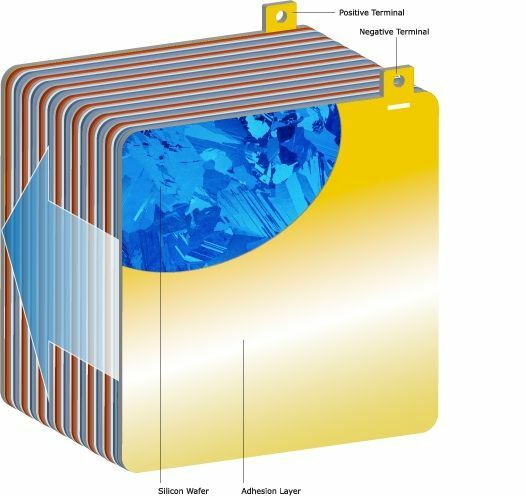 LightSail is intent on developing a more efficient approach to compressed air energy storage. Investors in the early-stage firm include Khosla Ventures, Peter Thiel, Bill Gates, and Total Energy Ventures. We published some new slides and information about liquid metal battery startup Ambri and its commercialization efforts. Here are the recent RFQs and RFIs for energy storage coming out of utilities in Hawaii, Ontario, New York, and California. More details on the New York program are on the way. Japan’s Ministry of Economy, Trade and Industry (METI) just launched a $100 million subsidy scheme for lithium-ion battery-based stationary storage systems, citing the 2011 earthquake, tsunami and Fukushima nuclear incident as the drivers for a focus on energy storage, according to reports on the PV-Tech website. That's just in the last few weeks. Here are some other important recent developments. Coda Energy has emerged from EV maker Coda's bankruptcy as a battery storage system provider with a no-money-down energy storage model, financed by Fortress Investment Group, the multi-billion-dollar investment firm that picked up Coda’s assets for $25 million in June. Over the past month, Coda Energy has installed about twenty of its energy storage systems across California. Going after the same demand-charge and backup applications as Coda, Stem has a $5 million financing program with Clean Fleet Investors, while Green Charge Networks just announced its own $10 million financing deal with TIP Capital. Reducing demand charges -- the portion of a commercial building’s utility bill that accrues whenever electricity usage exceeds a set amount -- is the primary economic driver for these battery systems. In markets such as California and New York, ever-rising demand charges can add up to more than half of a commercial customer’s utility bill. Metering building energy use, anticipating when it’s about to “peak” and injecting stored battery power to prevent it can nip demand charges in the bud. GTM Research predicts the U.S. market for distributed energy storage will grow at a 34 percent cumulative annual growth rate to reach 720 megawatts by 2020, with demand charge reduction as the top driver with more effective economic management of on-site solar PV quickly growing in importance. Gridtential is an early-stage energy storage startup looking to innovate and disrupt the long-established lead-acid battery market. We spoke with Gridtential co-founder and CEO Christiaan Beekhuis at last week's bustling Cleantech Forum. Beekhuis believes the incumbent lead-acid platform may still have some life left in it. He told us, "The incumbent tech will always win if it meets market needs." Beekhuis is formerly of solar monitoring company Fat Spaniel, acquired by Power-One in 2010. Michele Klein, formerly of Applied Ventures, and Peter Borden, formerly of Applied Materials Solar Group, are the other co-founders of Gridtential. Borden came up with the manufacturing innovation that might move lead-acid ahead. Gridtential is not going after the starter or ignition battery markets. Instead, Gridtential is going after the higher-end $3 billion traction market (wheelchairs, golf carts, industrial vehicles like forklifts or scrubber-sweepers), as well as traditional and distributed backup applications including off-grid solar and the residential and commercial UPS backup market. Beekhuis called it "applying modern manufacturing methods to improve an old technology." Borden's invention uses a "unique plate substrate" and "a full architecture to stack the plates. It's a full battery invention based on manufacturability and scalability," according to the CEO. The CEO also said that Gridtential will go after the large, existing high-end market before it looks at the still-emerging utility-scale market. As far as the utility-scale grid storage market is concerned, Beekhuis told us in an earlier interview, "People are guessing. The market doesn't exist yet because there is no low-cost, high-performance market product. 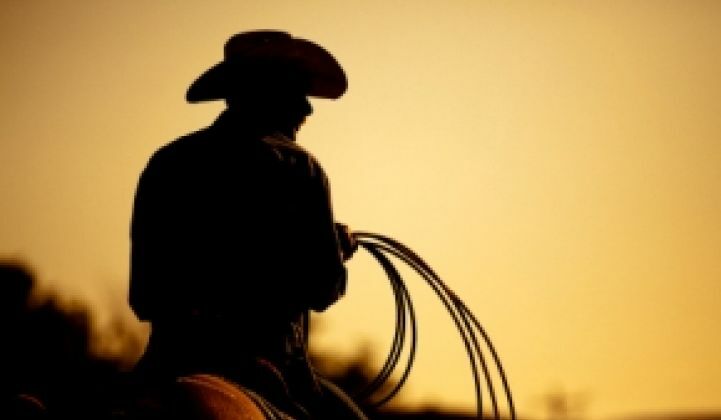 We see that market as nascent and pretty far in the future." "We're trying to be realistic about what it takes to break into the utility market," he added. "It takes quality and reliability data and life cycle data before a utility adopts." Instead, Gridtential looks to provide a drop-in replacement for the standard lead acid battery. The startup keeps the form factor and charge process intact but drastically alters the internal battery architecture for a higher depth of discharge, longer life and lower price, according to the CEO. It's a bipolar architecture using the entire area of a silicon wafer as the conductor combined with traditional lead paste and sulfuric acid -- stacked to build "a recognizable cell," according to Beekhuis. 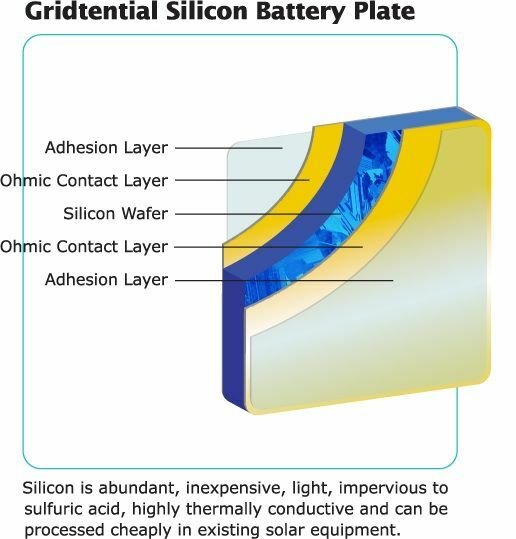 But it operates in a different way: leveraging the existing 125-millimeter silicon wafer and supply chain, Gridtential is able to take advantage of silicon's thinness, light weight and high thermal conductivity to extract better charge-discharge performance and avoid fouling of the plates or stratification of the electrolyte. 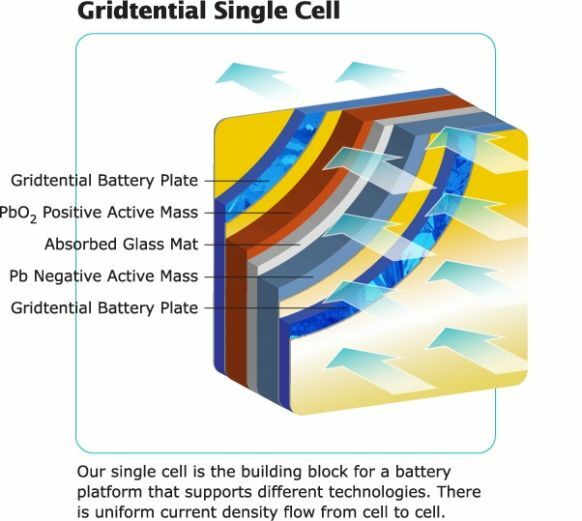 Gridtential's cells are stacked to build a battery of the desired voltage. "It's scalable and simple," said the CEO. The traditional lead acid battery is monopolar. Few bipolar batteries have made it to market, according to the CEO, because of thermal and other issues. Gridtential's design results in a 30 percent to 90 percent reduction in the amount of lead. Uniform current distribution helps improve cycle time and allows for a 2- to 4-hour discharge versus the 20-hour traditional range. The company will manufacture plates and "move forward as a licensee and seller of plates to achieve scale at low capital intensity," said the CEO. Potential licensees include the leaders in the lead acid battery market such as EnerSys, East Penn, Exide, and Johnson Controls. The CEO claims that a licensing model gives the startup "a credible path to revenue in the Series A time frame" and "does not need $100 million to get us there." Sonnenbatterie is bringing its energy storage system to the U.S. The Germany-based software company and hardware integrator has had a measure of success with residential and commercial energy storage in its native Germany and in the EU -- and now the firm is coming to California. Having sold more than 2,500 energy storage units in Germany, Austria, Switzerland, Italy and Spain since 2011, the firm knows how to build and sell battery-based storage. Will the product and its value proposition translate to American needs? Last year we spoke with Christoph Ostermann, CEO of Sonnenbatterie about Germany's storage market and incentive program. Ostermann said that German residential customers were fed up with high electricity prices and wanted independence from the utility. In the U.S., the motivation often seems to be the desire for backup power for when the grid goes down or during natural disasters, as well as a hedge against utility pricing. The CEO said that Sonnenbatterie had "more intelligence" than its competitors, without going into details. Jeff St. John notes that because the typical German home uses far less electricity than the typical U.S. home, 4.5 kilowatt-hours of battery is enough to “keep the power on all night long.” That’s important for a customer seeking energy independence as an end goal, rather than sizing their battery system for backup power when the grid fails. The privately funded German startup, founded in 2008, has built a software platform to integrate solar panels, lithium-ion batteries and home energy management systems into an "intelligent" system. These systems range in price from about $13,000 for a 4.5-kilowatt-hour storage system to about $21,000 for a 10-kilowatt-hour system, according to the CEO. We spoke with the Sonnenbatterie team recently. 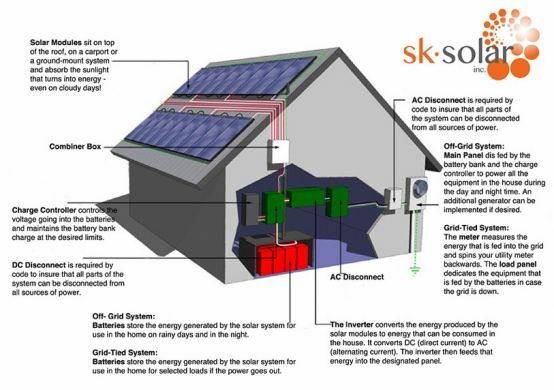 The company's new Sonnenbatterie Center in Los Angeles, CA is operated by solar installer and distributor SK Solar. Ostermann, the CEO, said, "Our business plan is not based on some magic reduction of the lithium-ion battery price." The company has stressed safety in battery chemistry and has settled on lithium-ion phosphate, sacrificing the energy density of other lithium-ion chemistries. After three years of organic growth, the company has taken funding from German investor eCapital. The CEO claimed that the firm was "currently profitable."